6-Slot Rapid Rate Charger with Power Supply. Six Unit Rapid Rate charger (2 to 3 hours) for Motorola CP040, CP140, CP150, CP160, CP180, CP200, CP200D, CP200XLS, CP340, CP360, CP380, EP450, GP3138, GP3688, PR400 radios. Six independent microprocessor controlled chargers with 6 charging cups. You can mix and match charging cups. Works with Ni-MH/Ni-Cd and some Li-Ion Batteries. 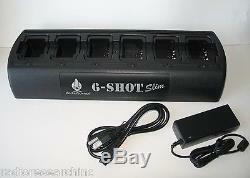 Can charge up to 6 batteries at the same time. CE and UL approved 110V/230V switching power supply. Dimensions: 20"x6 11/16"x3. Easy-Swap Interchangeable battery pods with Bull-Cord Detachable Car Charger. Rapid Charger with Internal Transformer. Charges Nicad, NiMH, Li-ion and Li-Poly batteries. Heavy duty durable design of polycarbonate plastic. 15V 900mA charge power per station. Agency approvals: UL, CE, CUL. Charge just the battery, or with the radio attached. Includes your choice of 6 Pods. Icom: F3, F4, F3S, F4S, IC-T2A radio. Icom: F14, F24, F33GT, F43GT, F43GS, F33, F44, F3161, F4161, F3161DT, F3021T, F3021S, F4021T, F4021S, F3011, F4011 radio. Icom: F50, F60, IC-M88 radio. Icom: F3GT, F4GT, F30, F40, F30GS, F40GS, F21S radio. Maxon: SP120, SP130, SL25, SL55 radio. Motorola: CP100, XTN Series, XU2600, XV2600 radio. Motorola: RDX Series, CP110 radio. Motorola: Saber Series, MX1000 radio. Motorola: MAGONE (BPR40), BearCom BC130 radio. Motorola: CP125, GP2000, PRO2150, BearCom BC120 radio. Motorola: CP200, CP150, CP040, EP450, PR400 radio. Motorola: GP300, GP350, P1225 radio. Motorola: HT1000, MTS2000, GP900 radio. Motorola: HT750, HT1550, HT1250, GP320, GP328, GP360, EX500, EX600, MTX8250, MTX8250LS, MTX850, MTX850LS, MTX9250, MTX950, PR860 radio. Motorola: XTS3000, XTS3500, XTS5000 radio. Motorola: TRBO, XPR series radio. Kenwood: TK2140, TK2160TK2170, TK3140, TK3160, TK3170, TK3173 radio. Kenwood: TK2200, TK3200 (KNB45L battery), TK3200L, TK2300, TK3300, TK2212, TK3212 radio. Kenwood, Relm: Relm RP16/RP99 Plus series, RPV3000, RPV3600 radios. Kenwood TK190, TK260, TK270, TK280, TK290, TK360, TK370, TK380, TK390, TK480, TK481, TK2100, TK3100 radio. Kenwood: TK3180, TK2180, TK5410, TK5310, TK5210, NX200, NX210, NX300 radio. Vertex: VX350, VX230 Series radio. Vertex: VX131, VX132, VX160, VX150, VX180, VX210, VX400, VX410, VX417, VX800 radio. Vertex: VX820, VX821, VX824, VX920, VX921, VX924 radio. 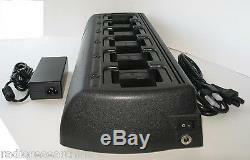 The item "Gang Bank Charger for Motorola CP200D CP200XLS PR400 CP180 CP340 CP360 EP450" is in sale since Sunday, May 27, 2012. This item is in the category "Consumer Electronics\Radio Communication\Parts & Accessories\Batteries & Chargers". The seller is "radioresearchinc" and is located in Staten Island, New York. This item can be shipped worldwide.